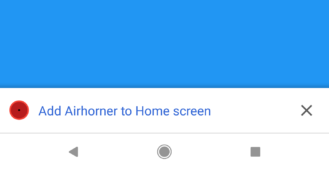 The first beta of Chrome 68 was released almost two months ago, and now the stable version is available across desktop and mobile platforms. This update includes the long-awaited blocker for redirecting ads, a new warning for HTTP pages, an improved download manager on Android, and more. 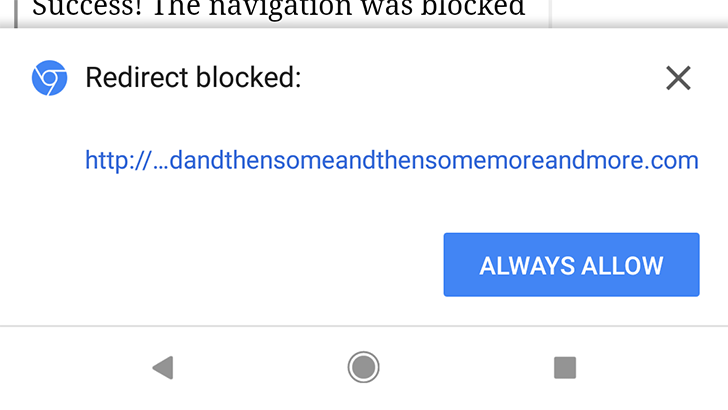 All the way back in November, Google said Chrome would start blocking advertisements from breaking out of their frame and hijacking the parent page. These sorts of ads have become incredibly common over the past year, often redirecting the user to a phishing site or other dangerous location. Android Police even suffered from them at one point, even though we only use Google AdSense/AdX. The blocker was supposed to go live for everyone in Chrome 64, but it was disabled at the last minute. Google wanted to ship it in Chrome 65, but it was delayed yet again. At long last, the blocker is finally enabled by default. You can see a demo of it here. A tab-under is when a page both opens a popup to some destination (usually where the user wants to go) AND navigates the opener page to some third party content (usually an advertisement). 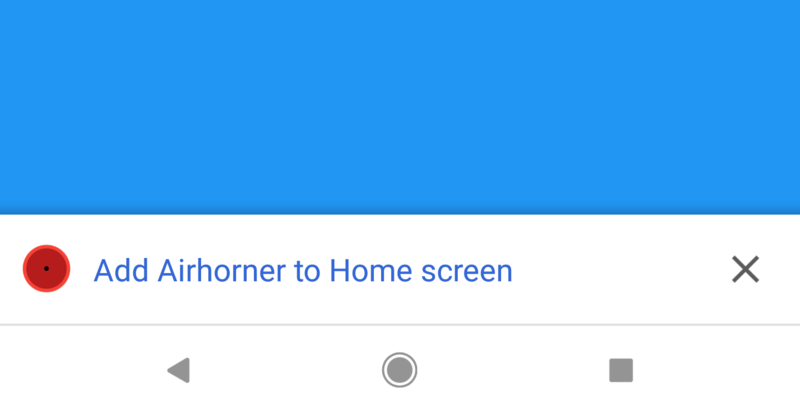 Chrome will block these navigations and show native UI to the user so they can follow the redirect just in case. In summary, once you update to Chrome 68, you should never see another surprise redirect ever again. Hopefully. Another long-awaited change is landing in Chrome 68: all HTTP pages are now marked as 'Not secure' in the address bar. 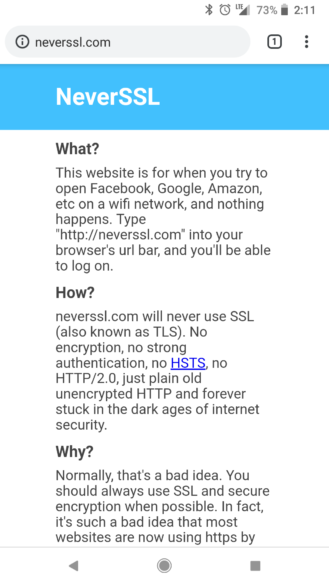 The behavior on Android is a bit different, since there's not enough horizontal space on phones for that message. Instead, there's an info icon in the address bar. 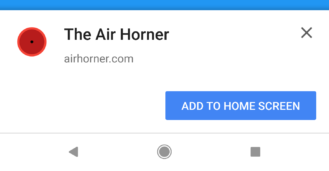 Chrome occasionally shows an 'Add to home screen' popup on some sites. The messages can be handy, but they take up a large portion of the screen, which usually just annoys users. With Chrome 68, the install banner is shrinking. You'll also start to see the install banner much less. Right now, the bar will only appear once every three months (per web site), but that could be changed in the future. 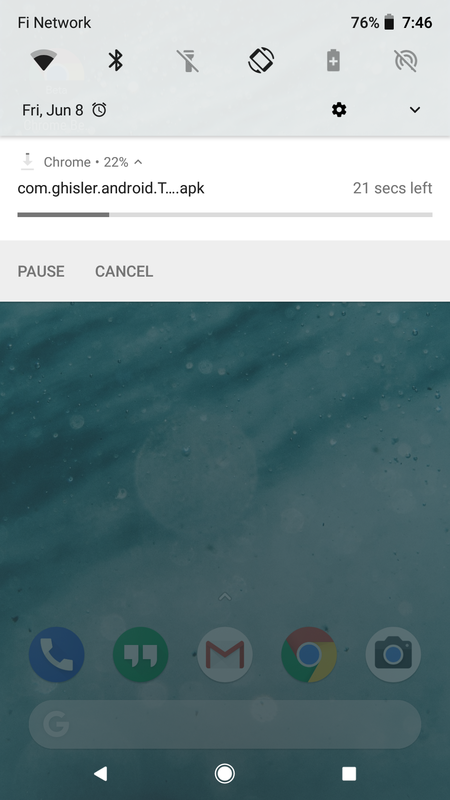 This is a holdover until apps start displaying their own install buttons, for which APIs are now available. 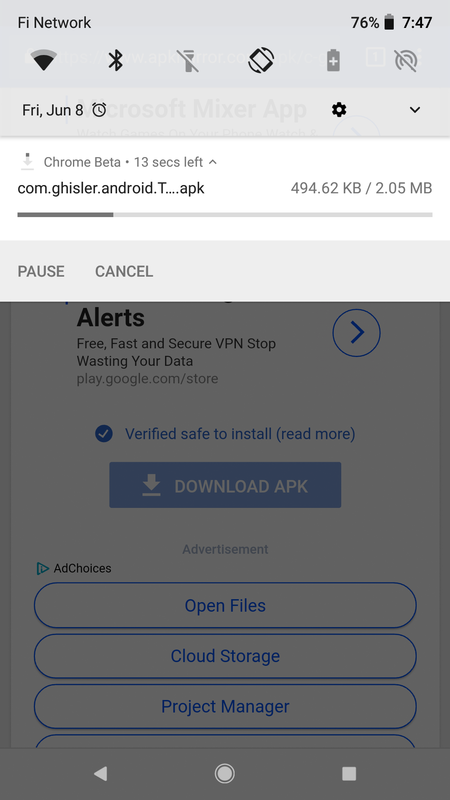 On previous versions of Chrome for Android, the only indicators for download progress were a percentage and the time remaining. This has changed with Chrome 68 - now you get the time remaining, the size of the downloaded file, the total size, and a progress bar. It's always nice to see real numbers instead of vague percentages, and this should be especially important to people on capped data connections. Chrome 53 came out in August 2016, and with it came the Payment Request API - sites could start to use Android Pay (now Google Pay) for buying items online. Safari on iOS and macOS also support the API, but those platforms obviously use Apple Pay instead. Chrome 68 improves on this with the Payment Handler API, which allows web apps to function as the payment platform in place of Google Pay. For example, on sites that support the Payment Request API, you could check out with PayPal even if you don't have the PayPal app installed. To try this out for yourself, go here to install 'BobPay' (an example payment handler), and then try checking on this demo page. 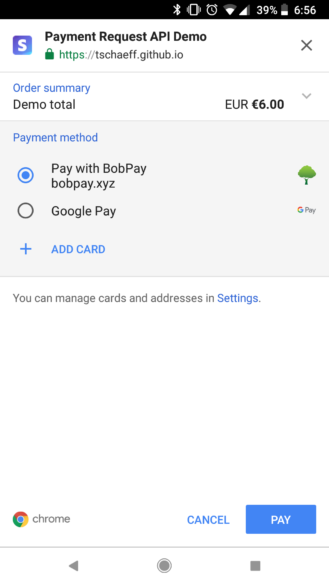 BobPay shows up as a payment method, right alongside Google Pay. 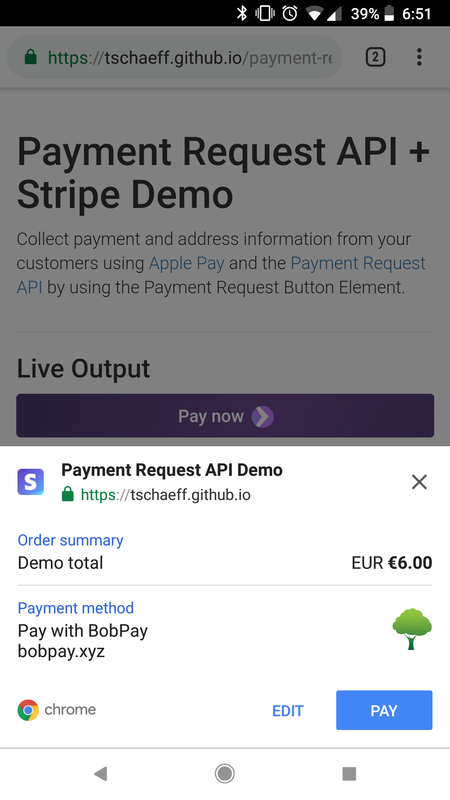 Now we just need more sites to adopt the Payment Request API. Like always, Chrome 68 includes changes for both users and developers. Here are some smaller features that ship with this update. Chrome 68 will check for Service Worker updates more reliably. Support for CSS position values with three parts, negative brightness values in CSS filters, the WEBGL_compressed_texture_atc function, and document.createTouch has been removed. The Keyboard Lock API allows apps to receive keys that are normally handled by the system or browser. Developers can now use 'x' as a unit of resolution. Search suggestions now appear on the New Tab Page, at least on Chrome OS (thanks Abdulvahid! ).